The wall of our garage (see photo) gets a lot of summer sun from mid-morning to sunset. In fact, the bricks get quite warm and radiate heat after the sun goes down. 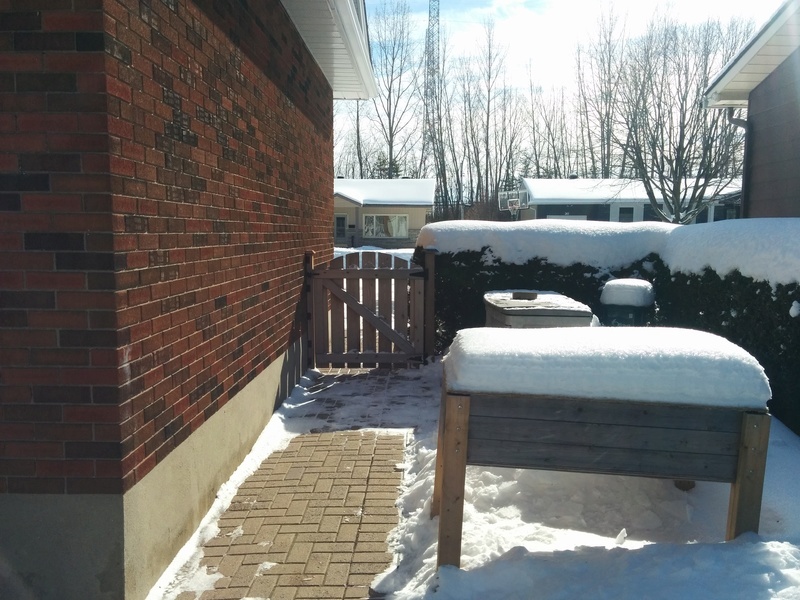 I have room for a small SFG box (maybe a 2x4 or 2x5) on the grass next to the sidewalk (behind the Table Top). I'm thinking I could build a trellis that would go up from the box and then across to attach to the wall. If I moved the Table Top I would have room for a larger box alongside the walkway. I think this would be a good place for trellising squash, or beans or tomatoes. I promised myself I would not go crazy this year with expanding the veggie garden but I can't help myself. Feedback welcomed. 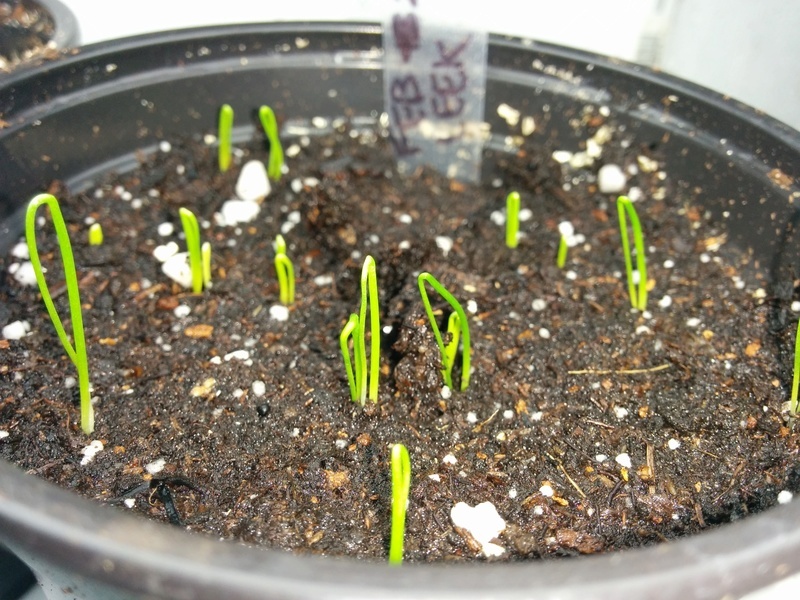 Today Feb.13 I started some Leeks and Onions indoors. They are warming up on the new heat mat. I filled the pots with wet potting mix, sowed the seeds, topped them off with fine vermiculite, and sprayed them with water. Are your summers gentle enough for a south facing red brick wall? You have nothing to lose and everything to gain by trying it. I already have it designed for you. @sanderson wrote: Are your summers gentle enough for a south facing red brick wall? You have nothing to lose and everything to gain by trying it. I already have it designed for you. It does get quite hot at the wall in the few weeks of peak summer that we get here. However, the vertical part of the trellis and the new SFG bed will be 3 to 4 feet away from the wall in about the same position as the legs on the left side of the Table Top. I can't wait to see your design. You know a squash arch over that walk way attached to the roof line would be rather pretty and squash would love the warmth. @Turan wrote: You know a squash arch over that walk way attached to the roof line would be rather pretty and squash would love the warmth. My Leeks and White Spanish Onions that I sowed indoors on February 13 did not germinate. 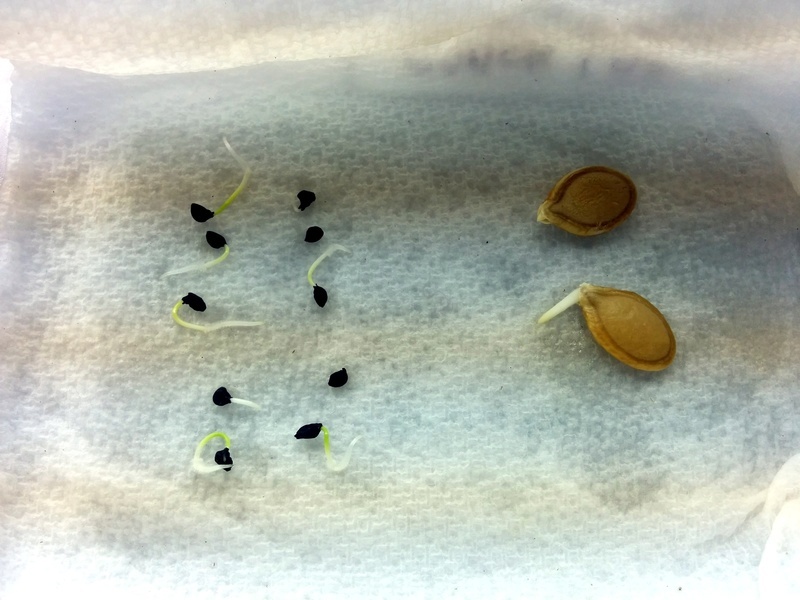 In parallel I did a germination test on damp paper towel and got 0 percent germination. So I bought new Leek seeds that I planted today. I am not going to start more onions but will buy sets to plant outdoors later. I also sowed Annual Bunching Onions indoors on February 13. 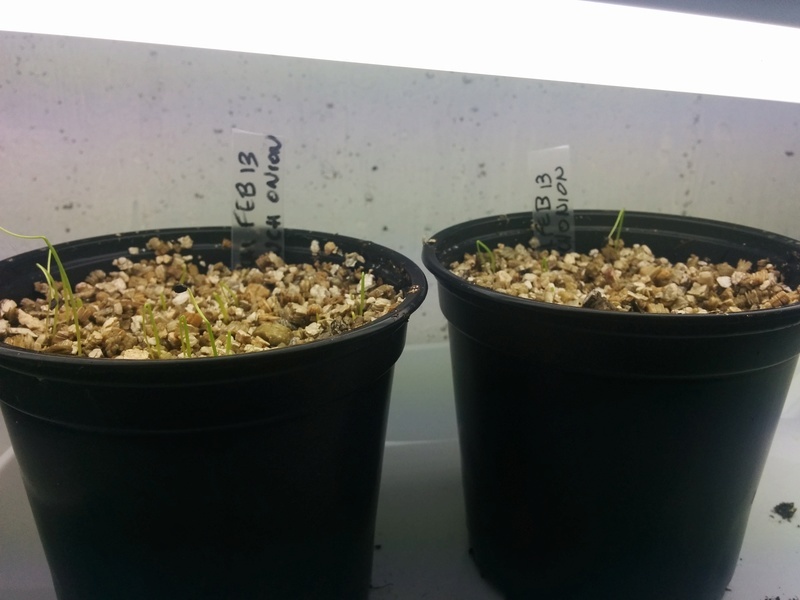 Those seeds did germinate and today I moved them under the fluorescent light. The reseeded (new fresh seed) Leeks are germinating. Germination test. 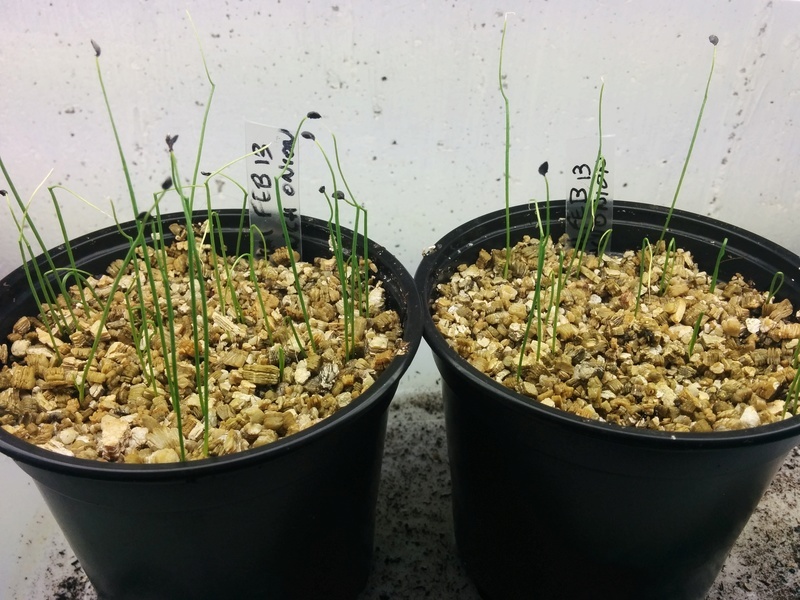 The new Leek seeds have an 80% germination rate. I also tried two Canada Crookneck seeds from a Canada Crookneck Squash grown in the SFG and eaten just a few days ago. Both seeds are germinating (one only just starting). The AeroGgarden is producing well. I have to keep cutting things back (and eating them of course). I had some of the Kale in a green smoothie. The Lettuce looks like it will soon be ready for a salad. I've noticed that now that the plants are bigger I have to add water more frequently (the AeroGarden reminds me to do so on the little screen at the front). I put my melons on the south side of my brick house, TD. In containers. They love it! Squash would, too, or eggplant. 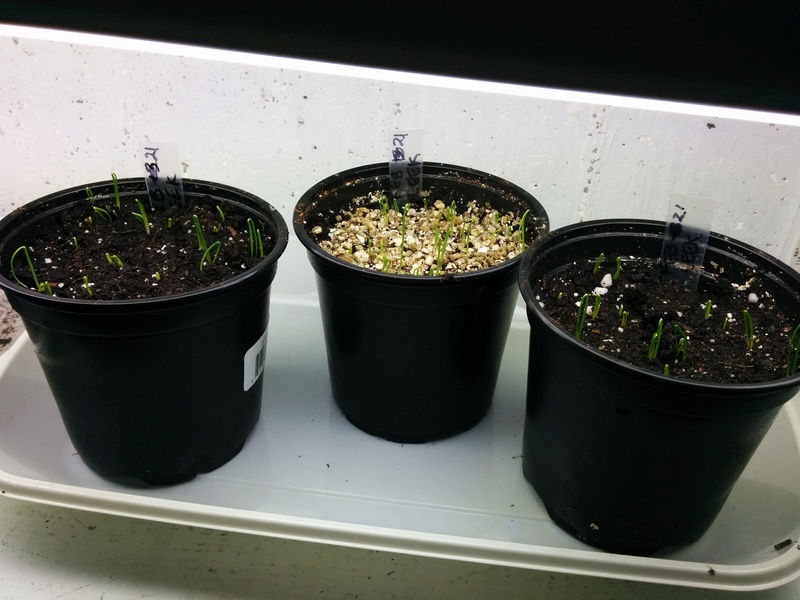 The Leeks are up and have been moved to the shelf under the grow light. Everything is looking great, following along and love the photos. @SQWIB wrote: Everything is looking great, following along and love the photos. 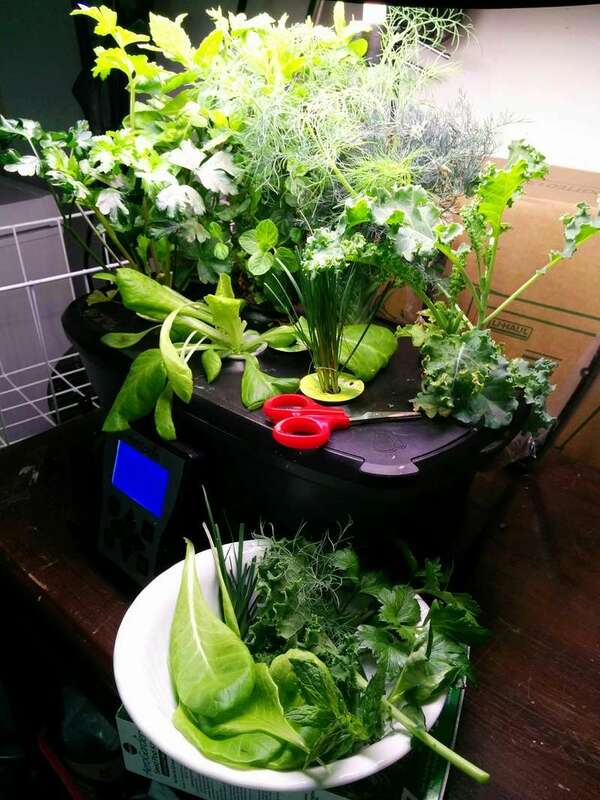 I harvested a few things, including lettuce and kale, from the AeroGarden. Used them, along with some store bought things, for a delicious lunchtime salad. Wow TD, you really have that Aerogarden going good. @yolos wrote: Wow TD, you really have that Aerogarden going good. Now I'm running out of liquid nutrients to put in it. The cost of AeroGarden nutrients is ridiculous here in Canada. Amazon wants $13 for a 3 oz bottle and $39 for a one quart jug. Add sales taxes and shipping and it is insane. In fact, the whole AeroGarden concept is outrageously priced. Amazon USA charges $25 USD ($32 Canadian) for the 1 quart size. Unless I can find a cheaper local alternative I expect my AeroGarden will be retired after this season. Luckily I only paid about $60 Canadian for it. TD, try making tea from worm castings or something similar like some of your compost liquefied. I guess I don't understand AeroGardens. Can you use open pots with Mel's Mix and just use its lights? @sanderson wrote: I guess I don't understand AeroGardens. Can you use open pots with Mel's Mix and just use its lights? 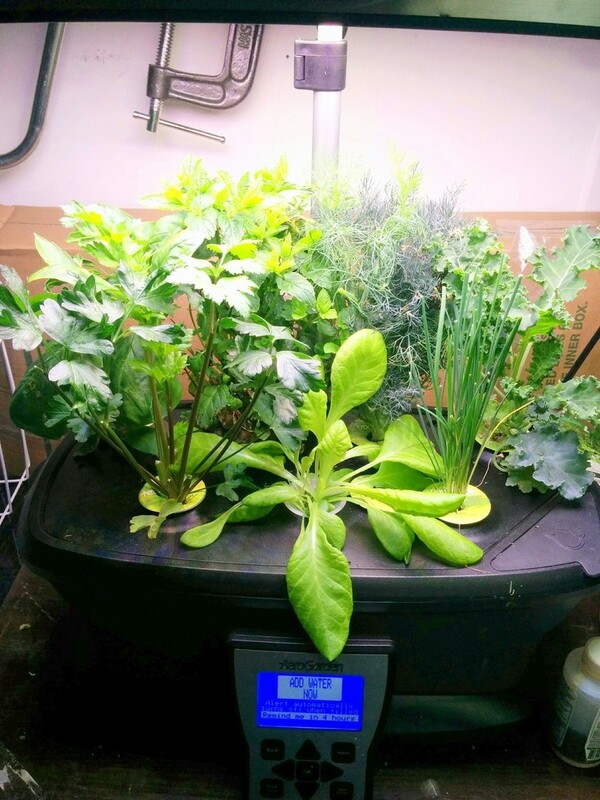 Aerogardens are hydroponic and have special growing pods for the plants. There is a reservoir for water/nutrients under the pod tray. Mine has a pump to circulate the water. Last year I used it just as a grow light by sitting my regular seedling pots on a tray under the LED light and not using the built in hydroponic feature. What an inspiring thread! TD - how are your ice cream buckets doing? What a great idea!! @GreenThumbMomma wrote: What an inspiring thread! TD - how are your ice cream buckets doing? What a great idea!! GTM ... Not much happening outside with those Winter Sown ice cream containers. Right now I'm making a list of more things I need to Winter Sow. I only had partial success last year with WS so it will be interesting to see what happens this year. 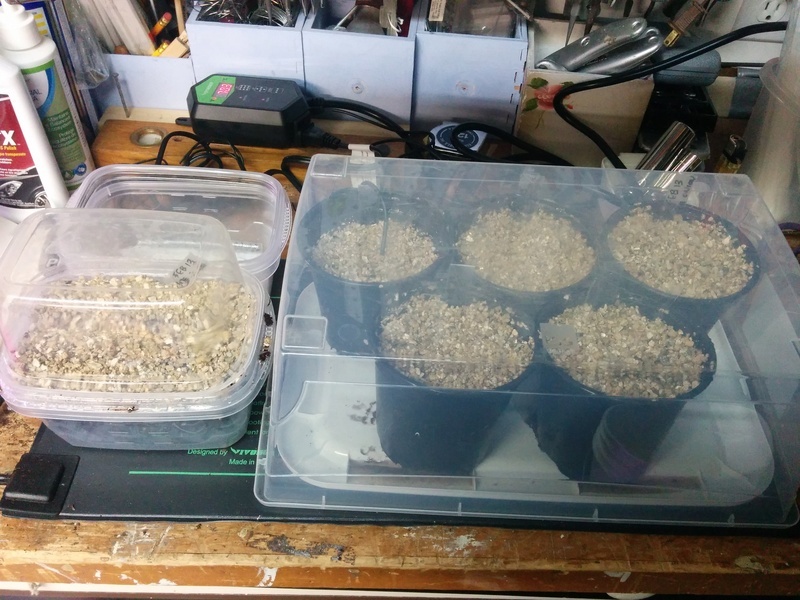 My saved Canada Crookneck seeds germination test is now at this stage. 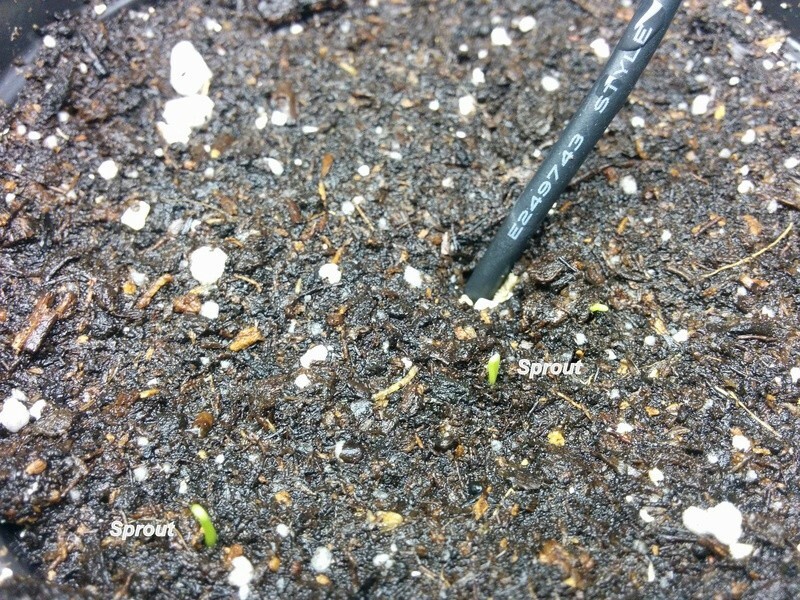 @trolleydriver wrote: My saved Canada Crookneck seeds germination test is now at this stage. Nice, TD. 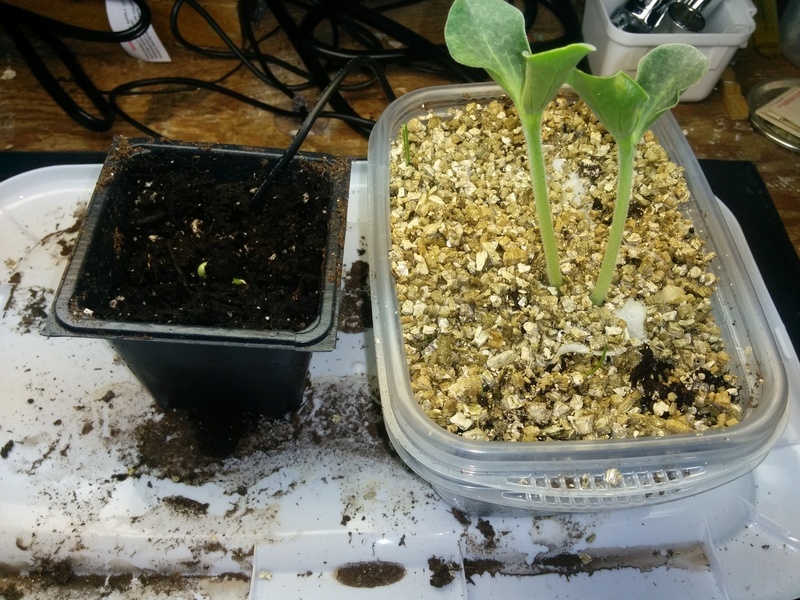 I just planted my squash seeds this afternoon. TD, What is on the right and what is on the left? Did I miss something?